swissmiss | SLR Camera Simulator! Want to play around with SLR Camera settings and see how it affects your photo, but without actually using an SLR? Well, you can do just that with the Online SLR Camera Simulator. 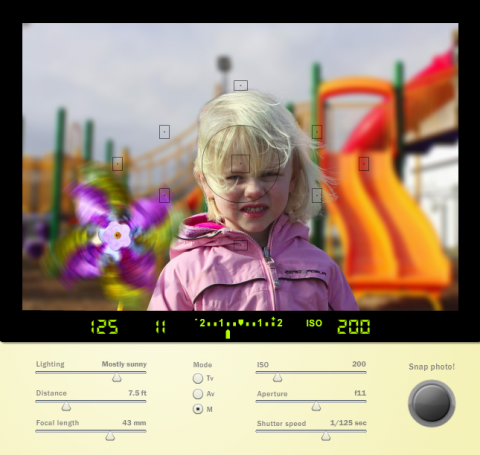 This simple application allows you to choose the lighting, ISO, shutter speed and aperture. A great tool to teach someone the basics of photography. that is fantastic. so hard to explain these types of things to people new to photography. Usually i end up taking a lot of photos for comparison. It’s been so long since I actually used a manual camera I’ve forgotten some of this stuff. Not really—but I can’t remember to explain it. It’s all intuitive to me now. This is a fantastic learning tool for photography. Nice find.